I’ve come to the conclusion life is all about change. Just when you’re comfortable with the status quo, suddenly you’re adjusting—adjusting to things like a big boy's bed...or a little brother. I’ve always been fairly flexible in adapting to new situations, but the latest change being thrust upon me has me somewhat perplexed. It seems that now, instead of continuing to wear my comfy, dependable diaper, I’m required to go through a regimen called “potty training.” I’m not sure I like it. Besides being a little scary—what if I fell right through that hole in the seat?—the potty is not nearly as convenient as a diaper. I mean, with a diaper, when you’re ready to go, you go, right? I admit, however, there have been a few upsides to this process. I got a super new potty seat that is bright, shiny red and has pictures of my favorite movie stars, Lightning McQueen and Mater. I also got a matching stool that helps me reach the lavatory. And, oh yes, there’s flushing. I love flushing. Pushing that silver lever and hearing that great whooshing sound are so...so empowering. But even with these perks, I’m not completely sold on the idea of using the potty. As with the other changes in my life, I fear I must bow to the inevitable. And I’ve found one of the best ways to master life’s challenges is with the help of a book. 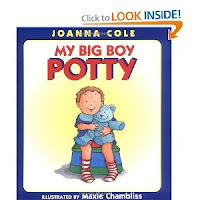 If you or a loved one is presently facing this stressful rite of passage, let me recommend My Big Boy Potty, written by Joanna Cole and illustrated by Maxie Chambliss. I closely identify with Michael, the protagonist in the story. He is about my age and size. Like me, he enjoys playing with his toys, and he loves reading books. At the first of the story, he wears a diaper—just like I do. Ms. Cole explains how Michael learns to use the potty, and by the end, he is wearing BIG BOY underpants! I haven’t quite reached that point yet, but I’m making an honest effort. And when I’m successful, I hope I get a pair of big boy underpants with Lightning McQueen and Mater on them. In the meantime, I’m finding the bathroom is a good place to get in some quality reading time. Instead of goldfish, I give My Big Boy Potty five flushes! Master Brooks, thank you for the recommendation! My daughter is fascinated with the potty right now. I think she would enjoy this book. Wow!I'm impressed that your daughter is already interested in the potty, as I know she is much younger than I. I think she would enjoy this book,too. She's in luck because Ms. Cole also has a potty book for girls, and as we all know, the process is different, depending on one's gender. Master Brooks, your parents might like to check out The Old Farmer's 2013 Almanac. It gives special dates for lots of things--even potty training--which should have you wearing cool underpants soon. I know a certain little boy who had great success with the Almanac's guidance. Excellent advice, Ms. Bryant! I will pass it on to my parents. I'm receptive to trying anything that will hasten my success and get me into some cool underpants! Master Brooks, I love that you have your grandma's sense of humor as well as her gift of storytelling - keep up the good work! Thank you, Ms. Harrington, for the compliment. And thank you for reading this post, as I know potty training probably isn't one of your top topics of interest. Thanks for the book recommendation- I enjoy reading new books on this important topic. Might I also suggest a title for your extra bathroom reading pleasure? It is called Everyone Poops (and in fact everyone does poop which is good to know). Parents sometimes don't like the illustrations but I think they are laugh out loud funny. Let me know what you think. Thank you, Ms. Marotta for the recommendation. I will most certainly pass it on to my parents. I'm sure I would find the illustrations hilarious, as I'm not a bit squeamish about that sort of thing. I second this recommendation. My son still thinks it is an awesome book--and he's four.